Some autoimmune disorders that can affect the ear include Cogan’s syndrome, relapsing polychondritis, polyarteritis nodosa, Wegener’s granulomatosis, systemic lupus erythematosus, ulcerative colitis, Sjogren’s syndrome, and rheumatoid arthritis. Hearing loss has been viewed historically as the main inner ear effect of an autoimmune problem, but the vestibular system can also be attacked. Several factors determine the type of vestibular symptoms that may be experienced. Those factors include the speed with which the vestibular loss occurred, the degree of loss, whether one side or both sides are affected, and whether the damage has triggered a problem with fluctuating function (for example, if endolymphatic hydrops developed from the autoimmune reaction). The symptoms of autoimmune problems can be similar, even indistinguishable, from other vestibular disorders. Diagnosing an autoimmune disorder as the cause of inner ear symptoms can be difficult. To succeed, a physician must have training and experience in these disorders. Most otolaryngologists are not trained or experienced in autoimmune disorders in general, and a rheumatologist trained in autoimmune disorders is unlikely to be highly familiar with vestibular function. Thus gaps exist in diagnosis and treatment. In addition, if vestibular symptoms occur as part of a body-wide problem, simultaneous non-vestibular symptoms may make the diagnosis difficult. No slam-dunk sort of diagnostic test exists for this type of ear problem. The best tests, such as the 68-kD antigen, are expensive and not widely available. Most tests can easily be positive when there isn’t an autoimmune problem and negative when there is; the tests aren’t as accurate as one would like. Sometimes the diagnosis is made only if a favorable response is seen to drug treatment. In general, autoimmune disorders occur more frequently in women than men and less frequently in children and the elderly. 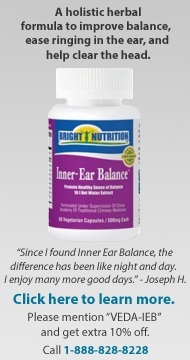 When the ear is attacked, the progression of damage and functional loss is rapid, occurring over weeks to months and usually progressing rapidly to the second ear. Autoimmune inner ear disease (AIED) is the name used to describe the variety of disorders in which the ear is the sole target of an inappropriate attack by the immune system. This disorder differs from other vestibular disorders because medical treatment can succeed when given early and aggressively. (“Early” means days to weeks or months.) An early diagnosis is important because treatment can not only stop the disease progression but in some cases can reverse the damage. The standard treatments for autoimmune reactions are drugs that reduce immune function (immuno-suppression), and they have body-wide effects. Their use requires diligence on the part of the patient and the provider. They include steroids, chemotherapy agents, anti-transplant rejection drugs, and the newer anti-tumor, necrosis-factor drugs. The physician must be both knowledgeable and experienced with these drugs and their side effects, and the patient must follow the physician’s instructions closely. Because a rheumatologist has extensive training and experience in these treatments, nearly all otolaryngologists and neurotologists have them manage the drug treatment. Drugs and their dosages cannot be tinkered with; side effects must be understood and watched for and never ignored. It is imperative that life on an immunosupressor drug be understood before treatment is begun. With the proper precautions, treatment can be relatively safe, and the results can be outstanding. General immune system research and study of autoimmune disorders is underway in many locations. Scientists are also conducting research related to autoimmune disorders and the inner ear. Most inner ear research has centered on finding an identifiable inner ear "marker" or chemical that can be tested for so that diagnosis can be faster and more accurate. Other research examines treatments. For example, the American Academy of Otolaryngology-Head and Neck Surgery in conjunction with the National Institutes of Health is studying the treatment of autoimmune inner ear disease. Although drug companies are not directly studying treatments for inner ear problems caused by autoimmune reactions, they are heavily involved in seeking pharmaceutical treatments of many more common and well-known autoimmune maladies. Autoimmunity isn’t involved in most cases of vestibular disorders; however, it can cause large losses when continuing unchecked. Effective treatments are available when the diagnosis is timely. Author: P.J. Hayback, R.N., M.S. McCabe B. “Autoimmune Sensorineural Hearing Loss.” Annals of Otology, 88:585–589, 1979. Stone JH, Francis HW “Immune-Mediated Inner Ear Disease.” Current Opinion in Rheumatology, 12:32–40, 2000. Click here to download the "Autoimmune Inner Ear Disease" publication.